Heat oven to 400ºF. Spray baking sheet with nonstick cooking spray. Separate dough into 8 rolls. Cut each in half crosswise. On baking sheet, place 2 halves with rounded edges touching to form butterfly shape. Slightly flatten each butterfly. Bake 11 to 17 minutes or until golden brown. Remove stems from cherries. At top of each butterfly where antennae would be, make 2 small holes with toothpick; insert 2 cherry stems into each roll. Remove lid from icing. Microwave icing on High 10 to 15 seconds or until of drizzling consistency. 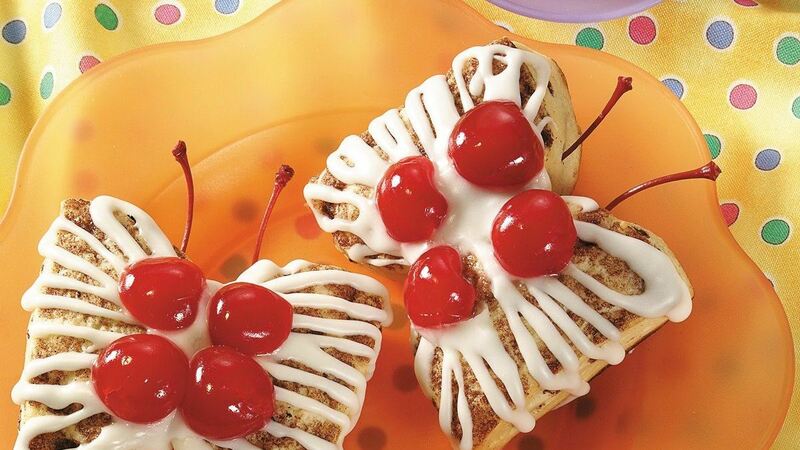 Drizzle icing over rolls; decorate with cherries. Serve warm.